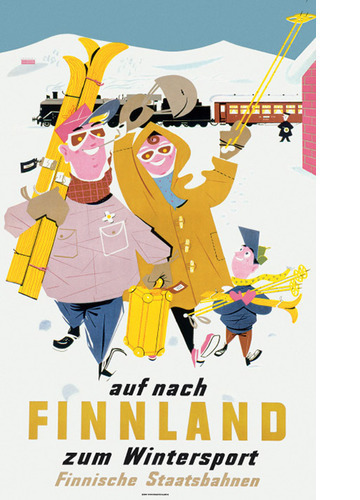 What was new to the poster art of the 1950’s was the happy mood – a clear counter reaction to the war and the years of hardship during the end of the 1940’s … Finally they even took their kids with them! 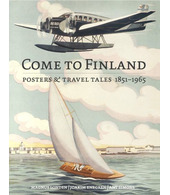 We love this poster since this is among the very first Finnish travel poster where the whole family sets out for that wonderful skiing-holiday. A sure mark of a growing middle-class in Europe, including Germany, after the war. 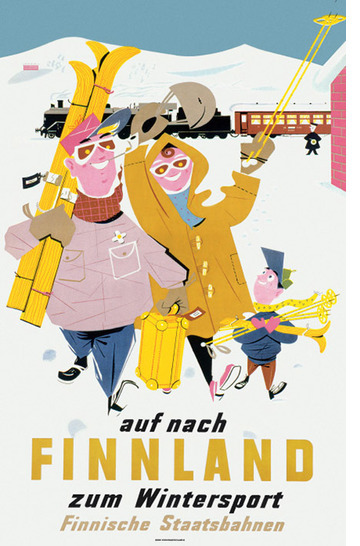 Even happy caricature families inspired by American comic books attempted to sell the idea of ski adventures, like in this amusing poster by Rolf Christianson.